Interior stair newel posts are available in oversize versions of any style, it is available. Custom Hardwoods can provide wood posts as large as 5-1/2" x 5-1/2" However, when you are no longer working with a lathe, and go to a boxed newel, there is no limit to the dimension. 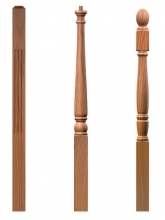 Red oak, poplar, and hard maple turned newel posts are in stock for quick ship. 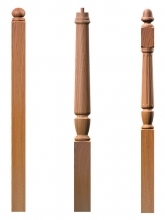 Some stair newel posts are in stock in american cherry. White oak, Brazilian cherry (jatoba), soft maple, african mahogany, santos mahogany, lyptus, walnut, hickory, ash, birch, white pine, yellow pine, alder and antique heart pine, have a 2 week lead time to manufacture. Our pledge is to provide you with excellence in woodworking. Custom Hardwoods is well known in the stair industry for providing fine crafted wood stair parts in a time when homeowners and builders are reawakening to the appreciation of fine woodworking.